Air ducts are an essential part of the heating and A/C system. Ductwork is a closed group of tubing that pushes air from the main temperature control system to the rooms of your home. By installing new ductwork, you’ll get improved indoor air quality and decreased heating and cooling costs. Have you been searching for a reliable company to complete your air duct installation project? The knowledgeable professionals at Cote’s Mechanical are the absolute best people for the job. As part of our full-service HVAC service, we specialize in air duct installation. Whether you are adding on to an existing house, upgrading an outdated system, or building new construction, you can count on the Cote’s Mechanical team to help you with your air duct installation and give you professional results for your installation project. Our installers are NATE-certified and always willing to listen to your concerns and answer questions. Consider Expertise – Not every HVAC company has expertise working with ductwork. Ask about the company’s experience with installing, repairing, and maintaining this equipment. Ask about NATE Certification – NATE certification is the North American Technical Excellence certificate which is held by most reputable HVAC companies. Make sure the firm is licensed and bonded. Read a Few Reviews – Get a good idea of the company’s reputation in the community by reading reviews online. Choosing HVAC ductwork contractors is a big decision. Don’t stress, but don’t make the decision lightly either. By choosing Cote’s Mechanical for your air duct installation or replacement, you’ll be assured quality work that will last for years. 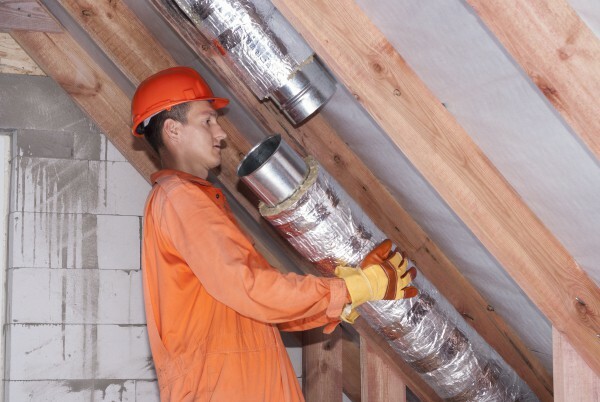 Ductwork installation is one of the most important steps in any HVAC installation projects. This installation process has a large impact on your home. The ductwork will have to be installed under floors, above ceilings, in your attic, and in your garage, so it requires a larger construction process. Ductwork installation doesn’t have to be a nightmare, as long as you are working with a trained expert who keeps your needs in mind every step of the way. If you would like more information about air duct installation or replacement, we encourage you to contact Cote’s Mechanical. Our experts are always happy to help. We want your next project to go smoothly and your ductwork to work properly for a long time.